Pest Control for beetles includes removing harboring areas, attractive lights and Responsible Pest Control! Interior and exterior Pest Control perimeter applications are very effective against Ground Beetle infestations. Eliminate objects (like logs and large rocks) that the beetles can hide under during the day several feet out from your home/building. Change exterior light to a less attractive Yellow Light Bulbs. These Beetles get their name from commonly being found on the ground. These little black beetles as adults are 1/16″ – 3/8″ long. Their bodies are slightly flattened and shiny black. Did you know that BEETLES are the biggest group of insects with 330,000 species! Ground Beetles usually hide under stones, and debris during the day and come out at night. They are very attracted TO LIGHTS AT NIGHT. 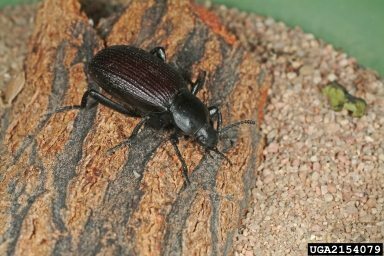 Ground Beetles enter homes/buildings by: crawling under door sweeps, or by flying through open doors and windows at night when lights are on.